Russian Blue cat guide, character, history and description of Russian Blue cats. A handsome cat with brains to match, the Russian Blue cat breed could be your perfect companion. You could think of the Russian Blue as a dapper gentleman of a cat - they are known for their quiet voices and gentle natures, while possessing a lot of intelligence, and their serene faces give them the air of one deep in thought. It's these very qualities which breeders agree make them a good choice for families or elderly owners - or pretty much anyone! Elisabeth Stark, chairman of the Russian and Abyssinian Cat Club of Scotland, adores these sedate and chilled-out beauties: "We call the Russian Blue a 'natural' breed as they aren't an extreme or flashy breed, they're very elegant and graceful, generally very calm and good companions. They might be shy when they are with strangers but they are very home loving and get very attached to their humans. One of the things I love about them is that when I watch TV they sit and watch it with me! They need to have their own humans and like to suss new people out who come into the house - but when they've decided they like you, they love you!" It's true - Russian Blues get very attached their humans and become devoted to their owners. They can be shy with new people but once they've decided you're a 'good one', they will lavish you with love and affection. Russians are excellent family pets as they get on very well with dogs and most other cats and breeders say it is very rare for a Russian to bite or scratch. Caroline Moore of the Russian Blue Breeders Association says: "They're extremely loving, some will want to be on you and others will simply want to be next to you. I've found that my males tend to be more loving and females love you when they need you, they're a bit more independent!" As the name suggests, Russian Blues have beautiful silvery-blue fur which is easy to groom. It's short but thick and velvety soft with a dense undercoat. They have stunning, almond-shaped green eyes in a short, wedge-shaped head topped with large, pointed, high set ears. The body is long and graceful with long legs, small oval paws and a long, tapering tail. Russian Blue cat breed history It is thought that the Russian Blue was first shipped to the UK back in 1860 by British sailors returning from the Russian port of Archangel, so they were known as Archangel cats. The breed was given its own class in 1912 and was renamed Russian Revolution five years later, finally given the name Russian Blue in 1948. Originally, the breed was outcrossed with Siamese (this was discontinued in the 1960s) and British Shorthairs to expand the gene pool. Russian Blacks and Russian Whites have been cropping up in litters for years and were first officially bred in the UK in the early 1960s, reintroduced in 2007. The GCCF has given preliminary recognition to Russian Whites and Russian Blacks, which are identical, except for their colour of course, to Russian Blues. Finding a Russian Blue kitten shouldn't be too difficult as there are now quite a few breeders in the country. Expect to pay between £400 and £500 for a pet kitten depending on location and make sure your kitten looks well and healthy with bright eyes, a shiny coat and mite-free ears. The Russian Blue is one of the more robust breeds in the fancy and they aren't known to suffer from any recurring health conditions.They also are one of the most low maintenance breeds in terms of grooming as their lovely thick fur rarely knots, and excessive grooming can take the thickness out of the coat, leaving it looking flat. A good brushing once a week is enough to keep them looking their glamorous best. Remember to keep an eye on their eyes and ears as well. 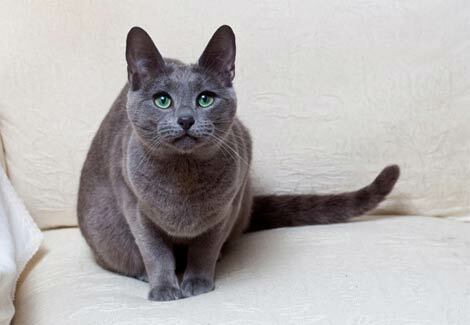 If you have searched for Russian Blues online, you may have come across cats that look slightly different to the GCCF-standard felines in this feature - these are most likely Russian Blues that meet CFA and TICA standards, more often found across the rest of the world and thus slightly more expensive and tricky to get hold of in the UK. Whilst the solely-shorthaired CFA and TICA Russian Blues are only available in blue and are more gracile than their GCCF cousins (females can reach 3.2kg while the boys barely tip the scales at up to 4.3kg), the differences extend to beyond just size. One of the Wychwood Russian Blues. Jeannine Parfitt of Wychwood Russian Blue Cats, the sole breeder of this standard in the UK, explains: "Their heads are a completely different shape - their eyes are rounder and their heads have a wider wedge shape, with their ears set further apart." These Russian Blues differ in personalities too: they are more outgoing, inquisitive and accepting of newcomers, but this does make them more of a handful. Jeannine adds: "They're very playful and love children, but they have no real focus on just one special person. They're funny little people and they're a fun breed to have. They just want to be with you all the time, but they're not destructive when you're out at work."